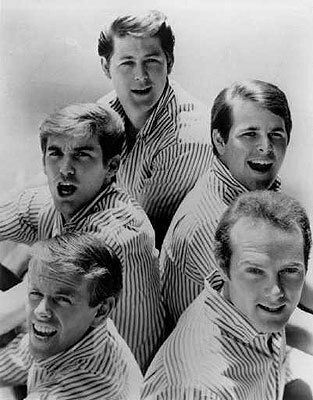 (Bettmann Archives) The Beach Boys in an undated press photo from the beginning of their career in the early 1960s. This article was originally published in the Boston Globe on December 10, 1973. One thing can be said about the Beach Boys concert at the Music Hall Saturday night. They showed Boston their musicianship has improved from the 1960s and the days of Annette Funicello and chrome engine blocks. With the forming of a hip intellectual subculture, the Boys needed to grow away from the shallow Saturday-night-dance surf music. They expanded themselves into more conforming areas of music. They have always been a harmonizing vocal group with instrumentation as a background, but through the years they have lost their ability to reach vocal highs, as was evident in "Help Me Ronda." Instrumentally, however, they have grown more intricate and sincere. "We have more of a depth to the creativity of our music now that everyone in the group is writing music," said lead singer Mike Love. "Brian (WIlson) was our original creator but he no longer tours with us. He's grown very introverted and only wants to be left alone." Wilson provided the creative genius that brought his brothers and the other Beach Boys to the top in the mid 1960s. Transcendental mediation added to the metamorphosis of the Boys. In 1970 they involved themselves with the Maharishi and began a tour with him. Since then Al Jardine and Love have become teachers of transcendental meditation. "It's helped my life and my mind. It's an expansion of my consciousness. Thus it has helped us musically. I became more creative and I always meditate before a show," said Love. The people that filled the Music Hall Saturday ranged in age from early teens to early 30s. Some had come to see their old idols and reminisce of old high school days. Others, that were still in high school came to see a legend, the oldest rock'n'roll band in America. Either way it was the Beach Boys they wanted, the Beach Boys they knew. They became slightly apathetic toward songs stemming from the group's transformation. They hadn't yet grasped the changes that had come about because of changing times. The applause was minimal for the new material, but when the Boys broke into an "oldie" the entire audience rose from their seats as one unity. They clapped, stomped and danced dances that haven't been seen for five years. New Year's Ever marks the 12th anniversary since the Beach Boys first performed together. "We played Long Beach 12 years ago and got paid $60, and I thought wow that's a lot of money and I don't even have to work. Today we've increased our income over 1000 percent per concert," said Mike with a happily thoughtful look.